Moreover, a settlement might open the doors of the EU and Nato to Macedonian membership, hitherto blocked by a veto from Athens. This would extract Macedonia from the limbo of geopolitical insecurity in which it has languished since Communist Yugoslavia’s disintegration. It would counteract the expanding Balkan presence of Russia, Turkey, China, Saudi Arabia and other Gulf states. It would reduce the risk that Macedonia might fall prey to violent internal conflict, destabilising the rest of the region. This is no idle caution. In 2001 an insurgency broke out among Macedonia’s ethnic Albanian minority, who account for about a quarter of the country’s 2m people. In the words of Ali Ahmeti, a former insurgent commander, the conflict risked turning into a bloodbath more devastating than the Bosnian war, in which about 100,000 combatants and civilians were killed. In the event, Nato brokered a settlement after a well-executed intervention. Mr Ahmeti now leads an ethnic Albanian party that governs with the Social Democrats of Zoran Zaev, the energetic young prime minister who spearheads Macedonia’s effort at reconciliation with Greece. In Skopje I recently heard Mr Ahmeti warn that everything achieved in the 2001 accord would be in vain, unless Macedonia secured Nato and EU membership. It lends credibility to Mr Zaev’s vision of a western-aligned Macedonia that support for this goal spans the ethnic divide and transcends memories of armed conflict. 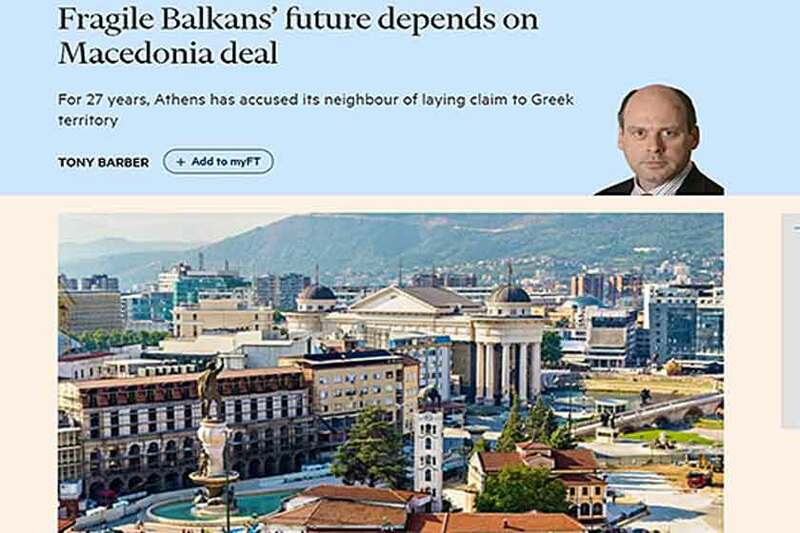 The prospects for a Greek-Macedonian deal are nonetheless uncertain. True, negotiators have narrowed the choice of name to Northern, Upper or Vardar Macedonia — the last inspired by the country’s longest river. One of these would be Macedonia’s name on the international stage. For domestic purposes, Mr Zaev wants to use “Republic of Macedonia”. This is not good enough for Greece, which detects a lingering claim on the northern Greek region of Macedonia. Athens is pressing for changes to Macedonia’s constitution that would eliminate such a threat. Mr Zaev is open to the idea, but any changes will need ratification twice from Macedonia’s parliament. Besides, he wants to bolster the legitimacy of a settlement with Greece by submitting any constitutional changes to a referendum. Clearing all three hurdles will not be easy. Nor should Greek approval be taken for granted. Alexis Tsipras, the leftwing prime minister, spots a chance for glory. Yet his nationalist coalition partners, Greece’s conservative opposition and the Orthodox church are vocal critics of his diplomacy. Behind the scenes Russia is stoking hostility to a deal. With elections due next year, Mr Tsipras may find that rising political temperatures at home render talks with Skopje too hot to handle. Lastly, not all EU governments are keen to open accession talks with Macedonia. At Nato some do not see Macedonia’s entry as a priority. We shall learn more from an EU summit in June and a Nato summit in July. Both events may arrive too soon for a Greek-Macedonian deal. If so, the EU and Nato should resist the temptation to use the setback as an excuse for neglecting the Macedonian question. The Balkans today is too fragile to permit such complacency.